If you are under 18 years old, you must fill out the waiver below (see link at the end of this description) and bring this signed waiver with you to the first class session. This class is for Nevada Motorcycle endorsement only. 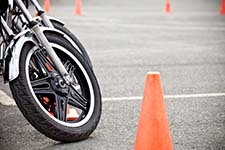 The Basic Ridercourse introduces you to motorcycle controls, riding, basic maneuvers and traffic skills. You must be at least 16 years or age and be a licensed driver. You must have at least a 30-inch inseam to ride the bikes without tipping over. You must be able to ride a bicycle and possess the necessary hand/eye coordination skills to operate the clutch, brake and accelerator safely. Attendance at all sessions is mandatory. Upon successful completion of the course you will receive a completion card to take to Nevada DMV to get your motorcycle endorsement. If you are 5 minutes late, miss a class, are dismissed from class or do not attend, your class fee is forfeited. This is a difficult program; you may be dismissed if your lack of progression endangers you or your fellow classmates of if you are not able to master the necessary hand/eye skills to operate safely. If you are dismissed from the class you will not receive a refund. If you are under 18 years old, please complete this waiver. TMCC William Pennington Applied Technology Center. Please read: Please read: You must have at least a 30-inch inseam to ride the motorcycles without tipping over. If you are 5 minutes late, miss a class, are dismissed from class or do not attend, your class fee is forfeited. This is a difficult program. You may be dismissed if your lack of progression endangers you or your fellow classmates. You will not receive a refund if you are asked to leave class. Special Cancellation Policy: Cancellation of your class must be done 48 hours before class begins. There will be a $15 cancellation fee if you cancel 7 days prior to class start. There will be a 50% refund minus a $15 cancellation fee if you cancel 3-6 days prior to class start. There is no refund if you cancel within 48 hours of class start. If you wish to transfer from your current class to another class, it must be done 48 hours prior to the class you are currently registered for and there will be a $15 transfer fee.